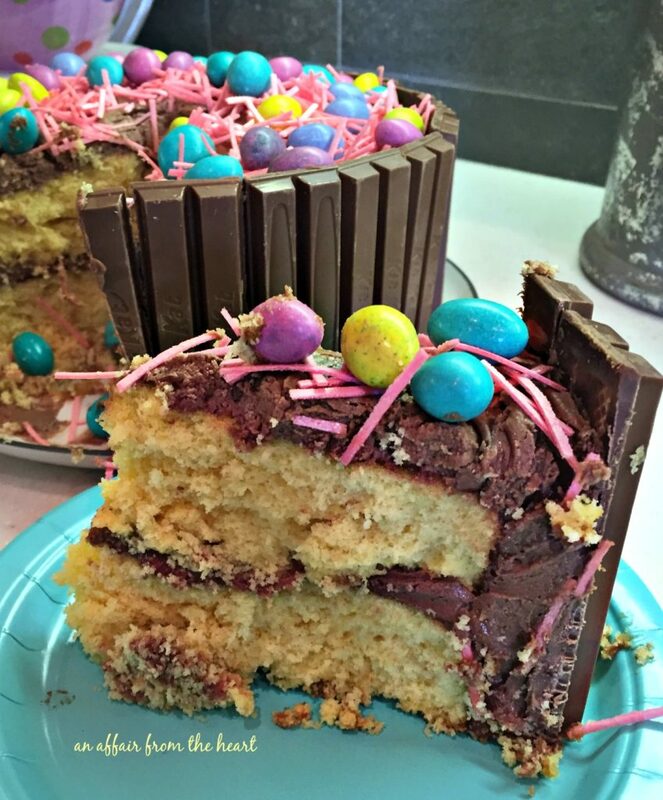 Yellow cake with chocolate frosting, encircled with Kit Kat bars and all dressed up for Easter! 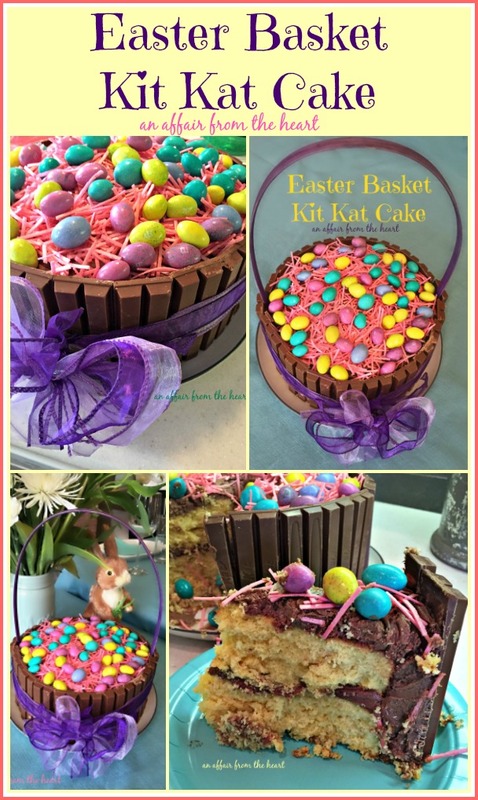 This year for Easter, I decided to use the idea of a Kit Kat Cake and turn it into festive Easter basket. 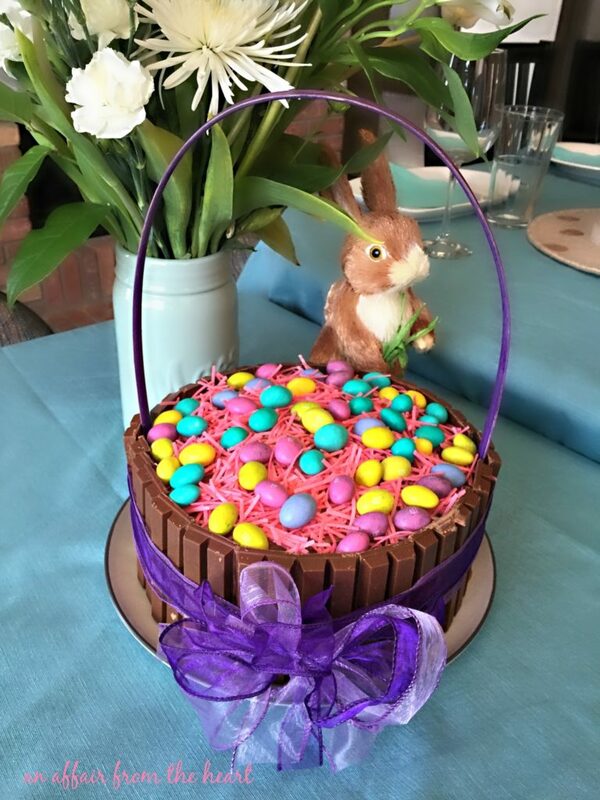 I feel a little silly sharing this Easter cake when Easter was almost a week ago, but there was no way I wasn’t going to share it with you! I was really tickled with how it turned out. You would be surprised at just how easy it was, too! 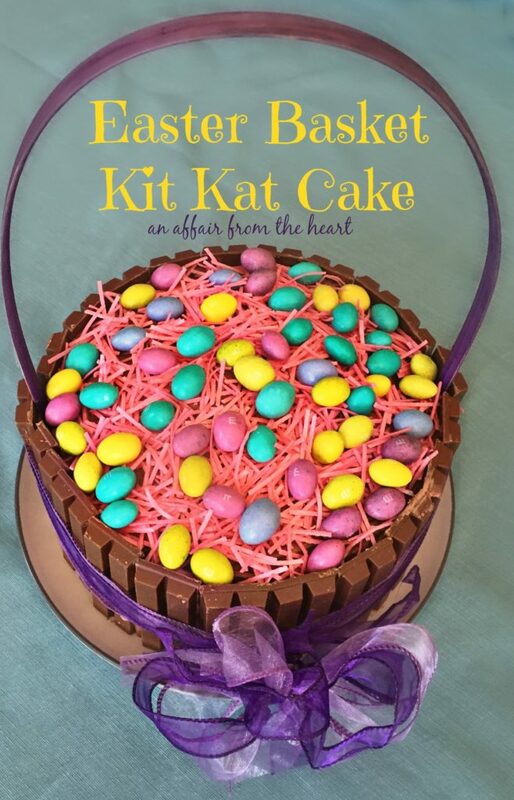 All you need was a box of cake mix, (or your own homemade) this recipe for My FAVORITE Chocolate Frosting, Kit Kat candy bars, ribbon, M&M Easter eggs, the handle off of an old Easter basket (or grab one from the Dollar Store) and Edible Easter grass. 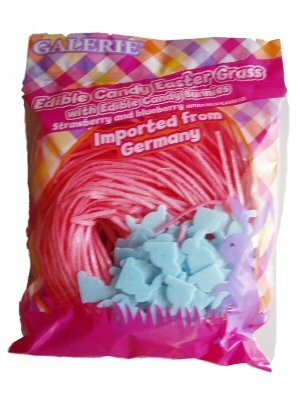 The edible Easter grass was something that I discovered this past year, it’s made in Germany, and I ordered mine on Amazon. They had three flavors, the pink that I chose was strawberry flavored. Of course, you could go the coconut route, too, but I have some that don’t really care for coconut, so I thought this was a safer bet for our Easter guests. So, if you are reading this now, and thinking that you want to remember where you found this next year when you need to make the perfect Easter dessert, click that “pin” button on the image above, and save it so you can have it ready for next year. Of course, you don’t NEED to wait for next year. Leave the handle off and fill the top with M&M’s or Reese’s Pieces! M&M’s have a special colors for all of the holidays! Switch it up — use different flavors for the cake — it’s your cake, make it your own! Prepare cake according to box instructions. Bake in 2 layer cake pans, cool. Plate the bottom layer, and frost the top with a layer of frosting. Add the top layer. Continue frosting top and sides of cake. Begin adding Kit Kats to the sides, two at a time made it easier for me. Once you have made it around the cake, securely tie with a ribbon, leaving the bow in the front. Make sure it's tight, so the basket handle doesn't "spring" too much and push your Kit Kat bars out. Insert the handle into the cake, pushing all of the way down to the plate. 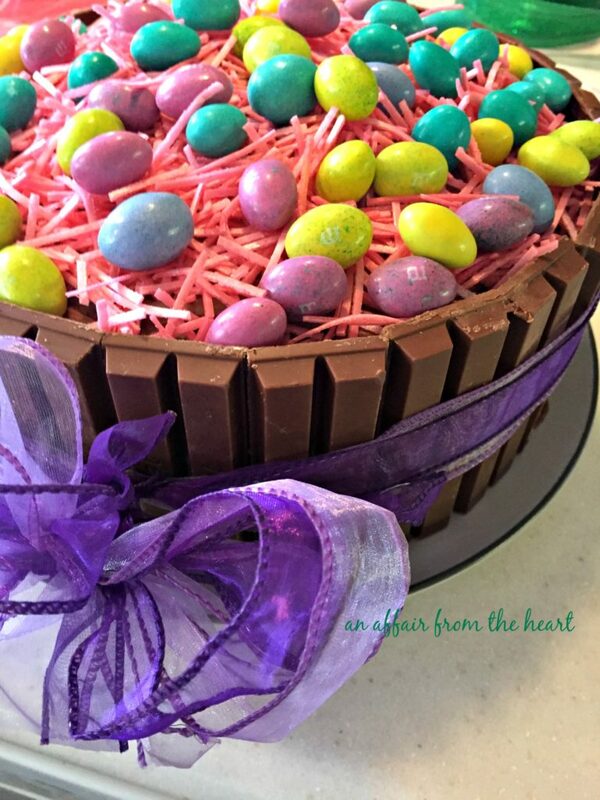 Top with Edible Easter Grass and M&M eggs. * Use whatever cake mix flavor you like, or your favorite homemade. *** It took 10 1/2 Kit Kat bars to encircle my cake, I used 9 inch pans. If you use 8 inch pans, it will take less. **** Of course, the handle can be left off and you can decorate however you like, for any occasion.